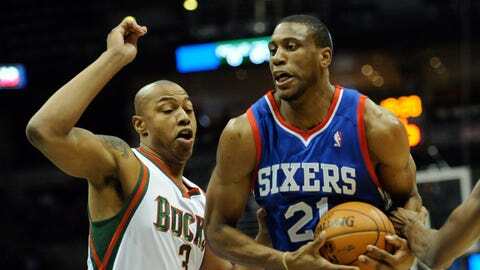 Philadelphia forward Thaddeus Young drives to the basket against Bucks forward Caron Butler in the first quarter Saturday night at BMO Harris Bradley Center. MILWAUKEE — Down yet another key player and coming off an overtime loss Friday night, Bucks coach Larry Drew didn’t know what to expect from his team against the Philadelphia 76ers. The Bucks found out starting forward John Henson couldn’t go just before opening tip, but veteran Caron Butler’s return to the lineup and Khris Middleton’s hot shooting night sparked Milwaukee to a 116-106 victory over Philadelphia at the BMO Harris Bradley Center. After fighting hard and falling in overtime the past two games, the Bucks finally got something to show for their resiliency. Starting in place of Henson, who was a late scratch due to bruised left knee, Butler came out aggressive in his first game since Nov. 27. He made three of his first four shots and 13 points with seven rebounds in the first half. "Something that I saw the last two or three games, the guys were really developing a good style and a brand of basketball amongst the young guys," Butler said. "We just needed a little something to get us over the hump. I was just really trying to get out there bad to show what I’m capable of doing and trying to lead this team." Drew felt the Bucks have missed Butler’s leadership in the 12 games he’s missed. Butler finished with 22 points and 11 rebounds, but many of his teammates credited his presence for helping the Bucks to a victory. "Throughout the game, he was on the floor talking and pumping his teammates up," Drew said. "Even during the timeouts in the huddles, he was keeping everybody positive. When we had a couple of bad stretches he kept the guys positive, and that’s something we’ve really missed with him being gone." But it wasn’t just Butler who helped Milwaukee through a rough patch Friday. After Philadelphia used an 8-0 run to start the third quarter to cut the Bucks’ lead to 59-57, Middleton hit his next five shots to help push the lead back out to 13. Drew said Middleton "took the game over" and hit some critical shots when the Bucks were in a bit of a slump. "He did a great job of loosening up everything," Butler said. "They were closing out extremely hard and he was just finding pockets and getting into the paint, hitting floaters. Every time they gave him air space he hit the jumper." Middleton finished with 27 points and hit all 10 of his 2-point shots, finishing 11-of-15 from the field with five rebounds and four assists. "We just ran our offense and got what we wanted to get out of it," Middleton said. "We had a nice pace to our offense, moving side to side finding the open guy. "I just was able to find open spots and my teammates were able to find me and make it happen." While Butler, Middleton and Brandon Knight all scored over 20 points, Drew felt the big difference in Friday’s victory was the minutes Miroslav Raduljica provided off the bench. With Henson out, Raduljica and Ekpe Udoh were the only two healthy big men left. Drew opted to start Udoh, but needed Raduljica for 22 minutes off the bench. The rookie scored a career-high 14 points on five-of-seven shooting. "From one side it’s bad because all of those guys are injured, but I’m part of the team as anybody else," Radujlica said. "I’m here to help and I think I’m doing that every time I get a chance." His chances have become more frequent with all of the injuries, and the Serbian has taken advantage of his time on the court. Raduljica is averaging 11.0 points over his last three games and appears to be getting a better feel of the NBA game. "Let’s say yes. Let’s say it like that," Raduljica said when asked if he’s getting more comfortable on the court. "Everybody considers me a rookie and this is my first year, but I’ve played basketball before. It’s the same game only a little different. I’m trying to do my best and helped the team." Snapping their five-game losing streak was the first step, but now the Bucks must find a way to win consecutive games for the first time this season. Milwaukee is the only team in the league without two straight victories on the year. A week ago, Drew stood at his postgame press conference in Dallas searching for answers after another blowout loss. The Bucks made progress in the week since, even if they ended up with just one win to show for it. "It’s really great for the whole team, I think," Raduljica said. "Especially after these two losses. I think we played tough and deserved this win." Odds and ends: Bucks guard Gary Neal was said to be available by Drew pregame, but he didn’t play. Henson and Ersan Ilyasova both dressed despite being out injured, meaning they officially did not play due to coach’s decision. Drew was not sure if Henson would be able to return for Monday’s game in Charlotte. The second-year forward described the injury that occurred late in Friday’s loss to Cleveland as a "twist" of the left knee.